WHAT AN AMAZING Bath Toy!!! My toddlers absolutely love the Yookidoo Flow N Fill Spout! It runs on batteries, works just like a water faucet and has an easy off and on button for little hands! I can easily say from experience that this is the best bath toy we have yet to come across and we have through quite a few of them! My kids had a chance to play with the Yookidoo Flow N Fill Spout in the past and they loved it so much that when the Yookidoo company contacted me and asked if they could send me one to do a video of I was SOOO excited! 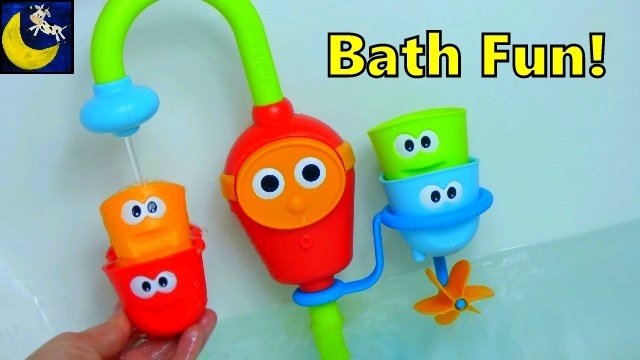 Babies and toddlers love running water and when you add the feature of a safe, easy to use running water toy in the tub it is tons of fun for everyone! Here in our house the Yookidoo Flow N Fill Spout is one of the BEST baby bath time toys for girls, boys, toddlers, babies and even I (the adult) play with it sometimes! Product Description: The multi award winning Flow N Fill Spout is an automatic spout that attaches to the tub allowing kids to play and experiment with water. It features three interchangeable tumblers that each have different spouting action. Create a shower, spin the propeller and fill the peek-a-boo friend until he floats to the top. · Creates an endless stream of water without wasting water from bath faucet, thus maintaining water temperature and water level in the tub. 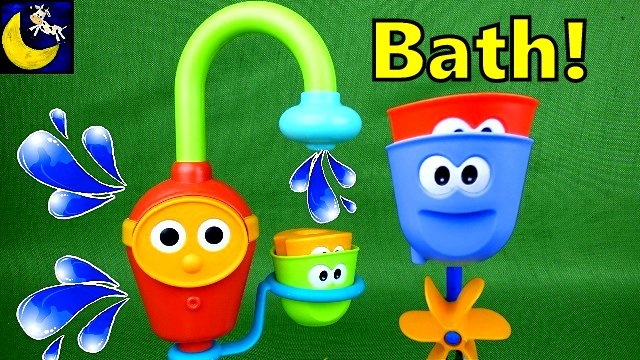 · 3 interchangeable bath cups each with a different water straining and spraying effects. · Stack cups and watch water run through them all! · Swiveling arm holds the bath cups - for playing, stacking and storage. · Introduces children to cause and effect process and to concepts such as full/empty, heavy/light, floating/sinking. · Easy for kids to operate. Especially designed for small hands. Company Description: Winner of a Parents Best Toy Award for 2015 and The Bump’s Best of Baby Award for 2016, international toy company, Yookidoo, creates of award-winning bath toys; on the go products; gyms & play mats; tummy time, crib, crawling, and activity toys; and rattles designed to engage the senses, stimulate the mind and body, and foster baby's continuing growth.